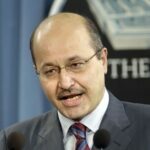 After the fall of the Saddam regime, Salih assumed the role of Vice Prime Minister (2004), Minister of Planning (2005), and then Vice Prime Minister in the Al-Maliki Government (2006-2009). In September 2009, he was appointed Prime Minister of the Kurdistan Regional Government. He then left this charge in 2012. On October 2nd, 2018, he was elected President of the Republic of Iraq. He is particularly mindful of issues related to the economic and democratic development of Iraqi Kurdistan, as well as the protection of human rights and minorities. He was one of the most active Kurdish politicians abroad in opposition to the Saddam regime. He earned a degree in Civil Engineering and Construction in 1983 from the University of Cardiff, and later a Doctorate in Statistics and Computer Applications in Engineering in 1987 from the University of Liverpool.